With our own set of intel pointing to a late March launch for the BlackBerry Z10, T-Mobile is going on the record with Bloomberg and stating they are “aiming to be the first American carrier ‘out of the gate'” with the device. For its part, the company formerly known as RIM has only stated that the Z10 would be available beginning sometime in March inside the US. With the American market still firmly established at BlackBerry’s biggest audience, the overall response to a “late” launch drove the company’s stock down 17 percent in the days after the January 30th launch. T-Mobile will sell the Z10 for $199 with a two-year commitment, with the device going on sale a week early for business customers. T-Mobile sees the arrival of devices like the Z10 a chance to win back business customers and increase their 5.5% market share of the business services market. The Z10 will also carry the honor of being one of the first LTE devices on T-Mobile’s network, along with the upcoming Galaxy S III LTE. Just how well BlackBerry and the Z10 will truly do once available on the nations largest carriers is anyones guess. I’m ok because I wanted to buy an unlocked one. Those prices are crazy high. Then it’s obvious you don’t know me. WOW…is that the only thing they are hoping for? That’s what I’m talking about T-mo!! This is AWESOME! Thank you T-Mobile. The Sooner the Better! Is it true the map app is terrible? That is good to know! I use my phone for directions when I drive so that is very important to me! what happened to the valentines weekend sales? Check the post on the Samsung sale. David, do you know the timetable for the Playbook to be upgraded to the new OS? I don’t know, sorry…BlackBerry’s CEO said it was forthcoming, but wouldn’t commit to a timetable either. There is very little chance that the Playbook will be upgraded to the new OS. I like the tablet and I have one but BlackBerry needs money and it is in new subscribers. I’m really excited and waiting for this, I will have it on launch day. Go T-Mobile! Who else is getting it? David, it’s time to put that poll up! Anyone know when T-Mobile/DT will report their Q4 earnings? Sprint did today sooo I can’t wait!.. Hopefully they will launch LTE officially when they report Q4. Also I’d like to see more reports of refarmed areas.. anyone seeing any? Buying it day one. even if its a week early for “business” customers. When theres a will theres a way. Great! Contract up with Verizon. If tmo gets it first, I’m there! Trust me, it will sell dozens! Can’t wait for it. oh wow tmobile will be the first to carry this new black berry device! WOW its like a WAY BETTER EXCLUSIVE THAN THE IPHONE! I can’t wait for this…. 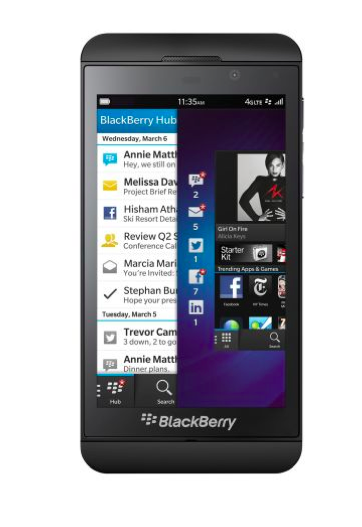 My bold 9900 is great but this Z10 is amazing… Go Blackberry!! Any news about the Q10? David, any chance tmo will end up offering that? I’ve been holding out for that one for the past year now. will be super disappointed if i have to switch carriers for it! hey genius, T-Mobile never said they were the ONLY carrier, they are just trying to beat everyone to it… So your link to Verizon + BlackBerry means nothing. I switched to Verizon from T-Mobile to get iphone. I have had nothing but trouble with iphone and Verizon. They keep sending me a none-workable refurbished iphone. I have lost important contacts, the phone keeps deleting my messages before I check them, it constantly resets my settings, it goes dark and I cant see anything and when I change the brightness it goes dark again. Icloud lost my saved information a few times. In addition, Verizon has good coverage but very poor customer service and more expensive. I would like to come back to T-Mobile if they get Z10 faster. Will it havve UMA/Voice calling? if so, im kicking my iPhone to the curb! I will be one of the first one’s to get my Z10. I’m loving that T-mo will have LTE and the Z10 will be the first phone on LTE. Both a Blackberry fan and a T-mo fan.